click, hosted agenda counter: Draw 5 cards. This is a card with a clear intent, but unworkable execution. See, the idea behind this card to let it act as a release valve or a reset button. Let's say you're in the all-too-familiar position of having a hand full of agendas. 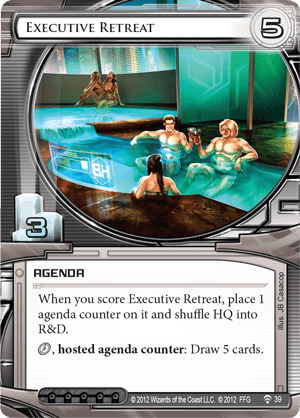 If you can score the Retreat, those agendas go back in R&D, taking the pressure off HQ for one turn. Then, you can either trickle back up to full hand size while making money, or you can spend one click to refill your hand instantly. If you're Titan, or score a Genetic Resequencing, you can ever do it twice! That's a fine goal, with a reasonable amount of usefulness. Except...it's tied to a 5/3, the hardest-to-score agenda size (with some exceptions). If you're flooded with agendas, that's usually because you haven't secured a remote server yet. And if you haven't secured a remote, then how are you going to buy yourself enough time to get five whole advancements on this agenda? It becomes a catch-22: if you can score Executive Retreat, you probably don't want to, and if you need to score Executive Retreat you probably can't. We can probably cut Lukas and the other devs some slack, here--after all, this was only the second data pack ever. They were still learning the ins and outs of the game. And so when it became clear that this card wasn't working, they essentially rereleased it as Corporate Shuffle. If you need to shuffle, you can do so on demand now, instead of needing to try to score when you're already under the gun. There is one good thing to come out of this card, though, and that is the hilarious deck of the same name by bionicsheep, which turns our favorite game of terrorists and digital conspiracies into a daytime romance reality TV show.